As a first time mom to a 9 month old baby girl, I absolutely treasure the moments when I feel like I’m really bonding with my baby. See the thing is, I’ve got a lot going on all the time, and I’m sure you do too. I actually work from home and despite the fact that I thought that’d make it easy to bond with her, I’m constantly juggling a ton of competing responsibilities. From keeping the house in order to working on my blog and YouTube channel, I’ve got a never-ending to-do list and if I’m being honest, I’m not always 100% focused on my baby girl. Does that make me a terrible mother? Ugh – that mom guilt is legit. Every single day, despite all the chaos all around me, I make it a point to focus all of my attention on her for just a few minutes many times a day. 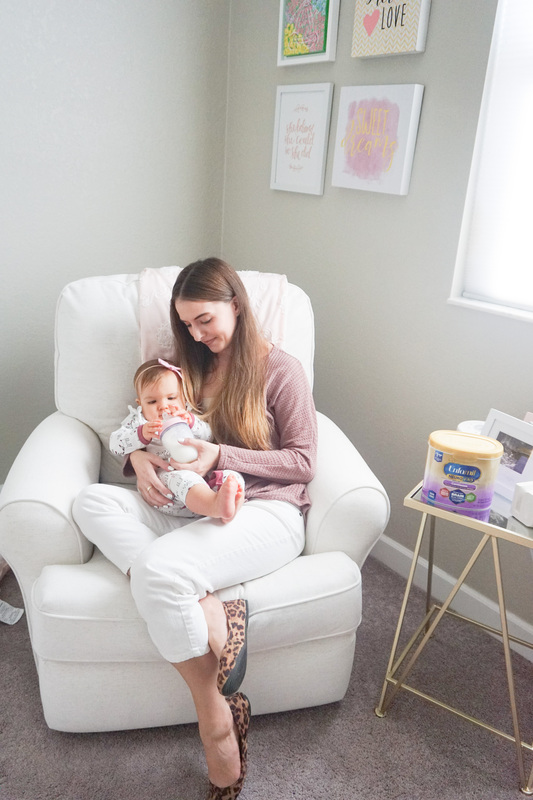 From playing with that little ball she’s obsessed with to taking her into her nursery to read her a story, I create simple focused bonding moments throughout my day – and pour my heart and soul into connecting as mom and baby. Now to help you incorporate some of these moments into your super busy day, here are 5 easy ways to bond with your baby. Over here, our mornings start off with all the cuddles! As soon as Riley wakes up – usually around 8:00 AM – I quickly make my way into her nursery to grab her before she gets mad. I’m typically greeted with the biggest baby smile that seriously kills me (in a good way) and after I change her diaper, I bring her into my bed so she can nurse. I still nurse her twice a day – in the morning and right before bed. But as soon as she’s done nursing, we spend a good half hour just rolling around under the covers, singing songs, and cuddling. It’s honestly my favorite part of the day and I know I’ll miss these moments when they’re gone (OK, I’m crying now). For a whole half hour it’s all about my little babe and her mama – before the e-mails and dirty dishes start piling up. So if you can fit it into your schedule, try to take even just 5 minutes in the morning to connect with your little babe. Ask them how they slept, ask them about their goals for the day, and if they’re too young to answer you, just give them a giant hug before the day gets crazy. Whenever it’s time to feed my baby girl (and man these days I feel like she’s eating 24/7) – I do try to use that time to connect with her. Sure, I could probably multi-task and feed her while doing a million other things, but I feel like her feeding times are perfect little breaks throughout the day to bond with her. First of all, it’s a great time to interact with her because she gets SUPER excited when she sees her bottle. I mean, I can’t blame her – the girl knows what’s good in life. Anyway, now that Riley’s 9 months old, she’s taking 3 bottles a day – at 11:00 AM, 5:00 PM, and 9:00 PM (right before bed). 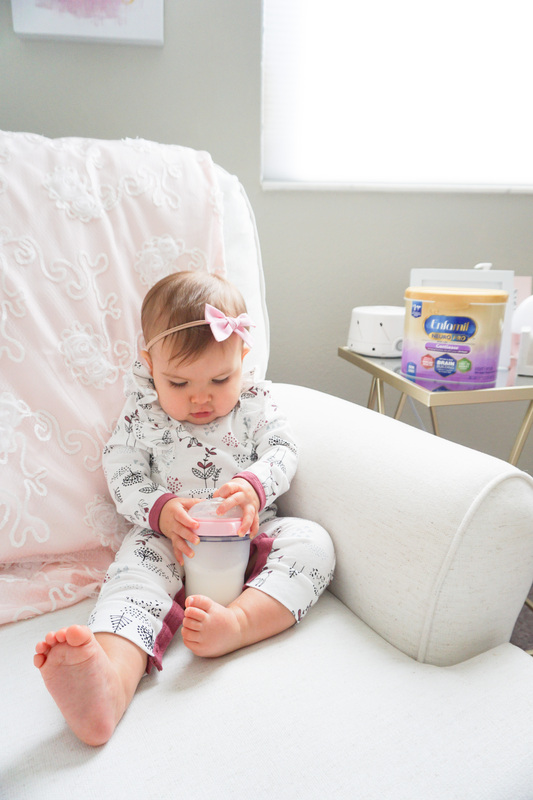 I do get a lot of questions about what formula we use for her, so here you go – we’ve recently been using Enfamil NeuroPro™ and she seems to love it. I exclusively breastfed Riley until she was 6 months old. After that, I started supplementing, and now she primarily drinks formula with the exceptions I mentioned earlier. 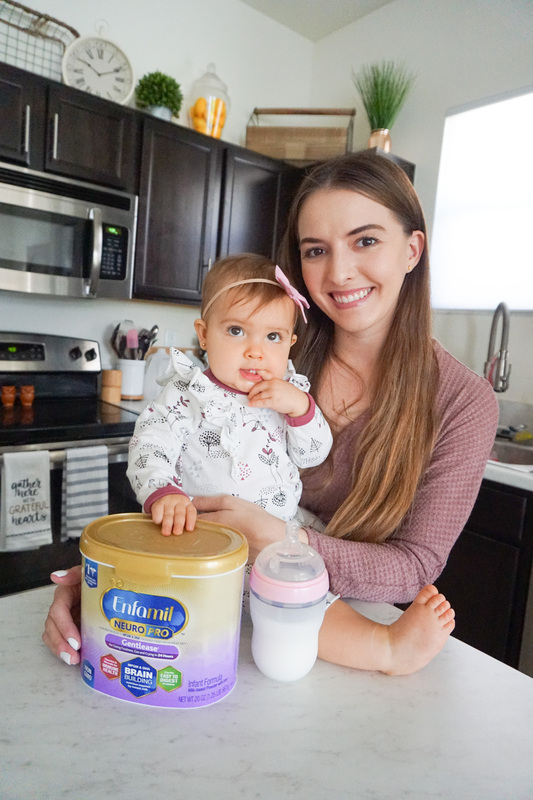 Obviously, when we started giving her formula, we wanted to make sure it’s good for her, so I love that Enfamil NeuroPro™ formula has a brain-building fat-protein blend of MFGM and DHA previously only found in breast milk*. Now I’m no scientist, but I do know how to Google, and it turns out that MFGM has been clinically shown to help close the gap in cognitive development between formula-fed and breastfed infants**. That definitely made me feel a lot better – knowing that the formula we’re giving Riley offers excellent nutrition. Plus, this Enfamil NeuroPro™ Gentlease formula helps ease fussiness, gas, and crying, so if you have a little one who could use some help in that department, definitely give this formula a try. So again, if you’re trying to find ways to bond with your baby, realize that they don’t always have to be super extravagant activities. Sometimes just being mindful and present in the most regular – boring – everyday things is exactly what you need to connect with your little babe. One of my favorite ways to bond with Riley is to climb into her play area and just play with her. A couple months ago we got her this baby gate so she could play inside of it with all her toys and she does spend quite some time in there. While I’m usually working on the computer while watching her play on her own, a few times a day I’ll stop whatever I’m doing to go hang out with her in there. She has these cute little blocks and I love making towers with them only to have her destroy them in 2.5 seconds. I’ll also lay down on the floor and let her crawl all over me, just to give her a few minutes of my undivided attention. So whenever you can – before work, after work, 5 minutes before bedtime – whenever it is that you can, take a moment to play. Throw a ball. Do a puzzle. Build a block tower. Believe me, your little one will love it, but you will too. Riley LOVES to read. Obviously she can’t really read – read, but she’s obsessed with books! 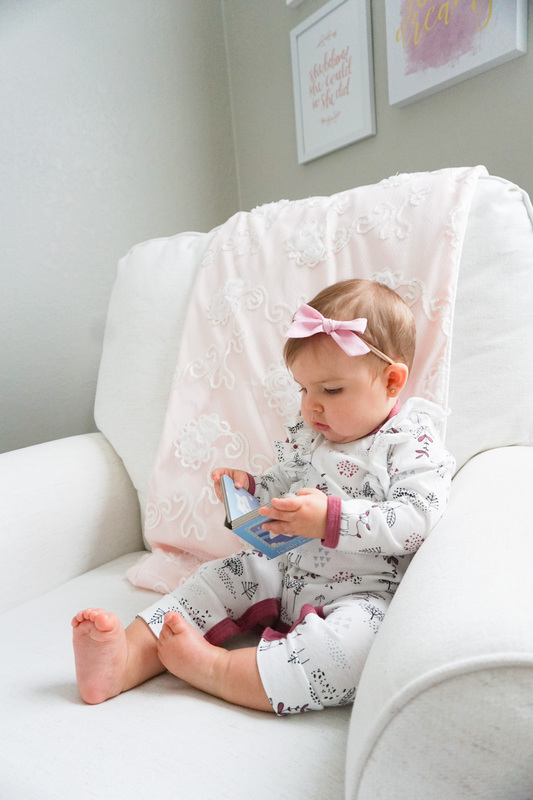 How stinking cute does she look reading her teeny tiny book? She has a set of a bunch of these little books and for whatever reason, they’re her favorite. So yea, I’m all about helping improve her cognitive development – areas of memory, concentration, attention, and perception. They’re actually a growing body of research that indicates that nutrition early in life may be important for learning later in the preschool years (Source Enfamil), and I want Riley to be a smarty pants. Pretty sure she’s on the right track. But as much as I love seeing her read on her own like this, I also love reading to her. I used to read to her while I was still pregnant and she was inside me, so I love those special moments when we sit and read together. It’s seriously such a good way to relax, unwind, and bond with your baby. So a few times a week, pick up one of the books you haven’t already read like 5,000 times and enjoy it together. No stress. No worries. Just you, your little one, and those strange little farm animals that go on adventures. Whenever I feel super overwhelmed and I can’t quite focus my attention 100% on my baby girl, I like to go somewhere quiet. Sometimes that’s outside, sometimes it means taking her around the block for a quick walk in the stroller, and other times, it’s as easy as going to her nursery. We spend a lot of time out in the family room where things are a mess and the tv’s always on, so just a simple change of scenery helps us bond a whole lot better. In her nursery I love to sit on the floor, play with her stuffed animals, and IDK, there’s just something about being in her room that’s so relaxing. So if you’re looking for more ways to bond with your baby, do what I do and go somewhere different. Somewhere quiet. Somewhere with less distractions. And somewhere that lets you focus on how absolutely amazing this thing called motherhood truly is. So there you have it! See, I told you it wasn’t too hard! Those are 5 easy ways to bond with your baby and you can start right now the next time you feed your little one. Visit Enfamil.comor call 1-800-BABY-123 (1-800-222-9123) for more information and to request a free sample. Enfamil® is the #1 brand of infant formula recommended by pediatricians and has been trusted by hospitals for over 25 years. 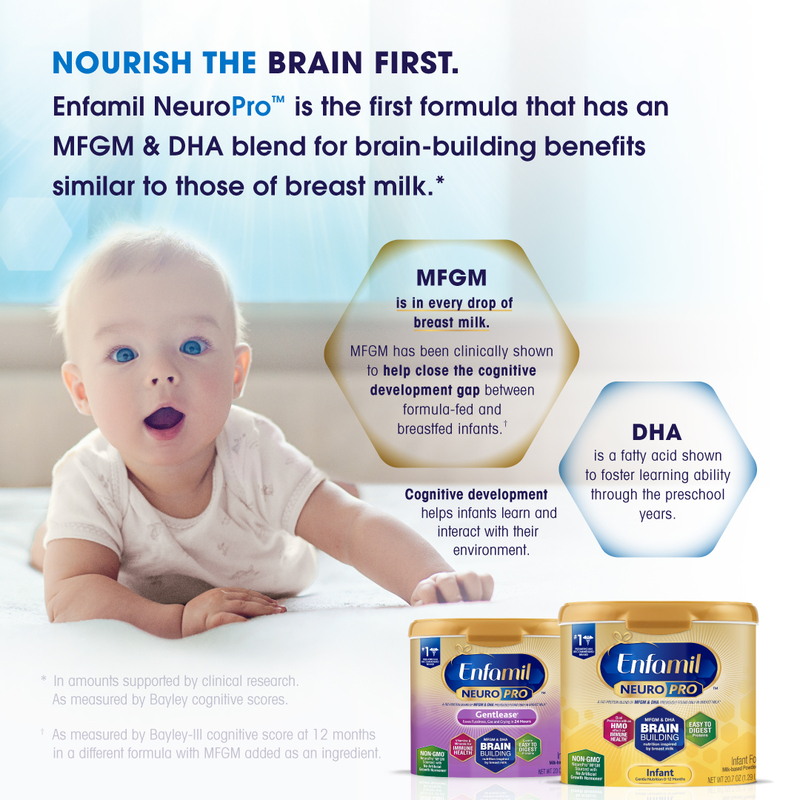 As a brand, they’re dedicated to understanding the nutritional benefits of breast milk and Enfamil NeuroPro™was born of that dedicated focus. They’re backed by decades of research on breast milk and multiple clinical studies on its brain building power – #BrainFirst: nourish the brain first — everything begins here. **As measured by Bayley-III cognitive score at 12 months in a different formula with MFGM added as an ingredient).